Big Nomination Update: Estefania Cortes-Vargas and Sandra Jansen not seeking re-election, and much, much more. Today’s big nomination news is the announcements by two New Democratic Party MLAs, Strathcona-Sherwood Park MLA Estefania Cortes-Vargas and Calgary-North West MLA Sandra Jansen, that they will not seek re-election when the next general election is called. Cortes-Vargas was first elected in 2015 and is one of the three first openly LGBTQ MLAs in the Alberta history. Cortes-Vargas is the current NDP caucus whip and announced on Facebook post an endorsement of crown prosecutor Moira Vane as the NDP candidate in the next election. Jansen, who was previously elected as a Progressive Conservative MLA in 2012 and 2015, had announced in August 2018 that she would seek re-election in Calgary-North West as an NDP candidate. Jansen left the PC Party in 2016 and soon after joined the NDP caucus. She was appointed Minister of Infrastructure in October 2017. 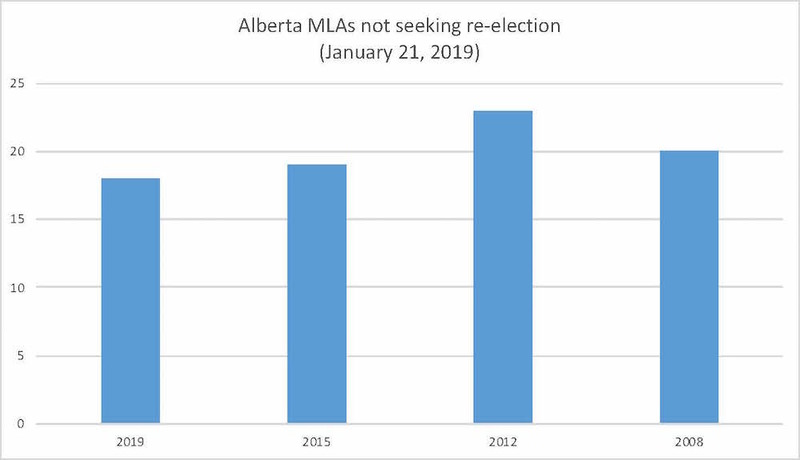 Cortes-Vargas and Jansen are the seventeenth and eighteenth Alberta MLAs to announce they will not seek re-election in 2019. As I have noted in the past, the number of MLA retirements during this election cycle is fairly average, with 19 MLAs not seeking re-election in 2015, 23 MLAs choosing to not run for re-election in 2012, and 20 MLAs not seeking re-election in 2008. I was away for most of last week teaching at the Jasper Labour School organized by the Alberta Federation of Labour and the Canadian Labour Congress, so I was not able to publish a detailed update last week. Upon my return I was not surprised to discover the list of nomination updates has grown considerably. Bonnyville-Cold Lake-St. Paul – Kari Whan is seeking the NDP nomination. Whan is a Grade 2 teacher at Cold Lake Elementary School. Calgary-Acadia – Liberal Lorissa Good was nominated as the Liberal Party candidate on January 21, 2019. She is the Salon Coordinator with Swish Salon. Calgary-Beddington – Heather Erlen will challenge Amanda Chapman for the NDP nomination in this north Calgary district.Erlen is the Alberta regional representative for the Canadian Labour Congress and is the former Team Lead for the Calgary Dream Centre Women’s Initiative. A candidate selection meeting is scheduled to take place on February 3, 2019. Calgary-Cross – Ricardo Miranda was nominated as the NDP candidate. Miranda was first elected in 2015 and has served as Alberta’s Minister of Culture and Tourism since February 2016. Naser Al-Kukhun was nominated as the Liberal Party candidate on January 21, 2019. 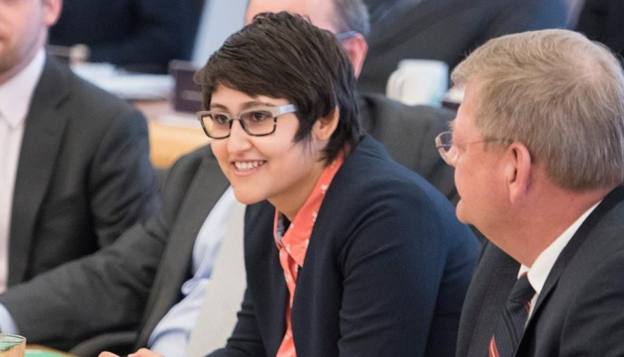 Calgary-Foothills – Sameena Arif is seeking the NDP nomination. Arif is active with the Calgary Immigrant Women’s Association. Calgary-Glenmore – Jordan Stein is seeking the NDP nomination in this southwest Calgary district. Glenmore is currently represented by NDP Anam Kazim. A candidate selection meeting is scheduled to take place on February 3, 2019. Calgary-Hays – Tory Tomblin is seeking the NDP nomination. Tomblin is a primary care paramedic with Alberta Health Services and was a candidate for the Calgary Board of Education in Wards 12 & 14 in the 2017 election. A candidate selection meeting is scheduled to take place on February 2, 2019. Calgary-North – Salima Haq was nominated as the Liberal Party candidate on January 7, 2019. Gary Arora was nominated as the Alberta Party candidate on January 13, 2019. Arora replaces previously nominated Alberta Party candidate Melanie Wen, who withdrew her candidacy in late 2018. Calgary-Peigan – Joe Pimlott has been nominated as the NDP candidate in this east Calgary district. Pimlott is a community liaison with Metis Calgary Family Services and the former executive director of the Aboriginal Friendship Centre of Calgary and provincial vice-president of the Metis Nation of Alberta. Ron Reinhold has been nominated as the Alberta Party candidate. Reinhold was the Liberal Party candidate in Calgary-Cross in the 2008 provincial election, where he earned 22.2 percent of the vote. He endorsed Dave Taylor in the Liberal Party’s 2008 leadership contest. Calgary-Shaw – John Daly was nominated as the Green Party candidate in this district on January 21, 2019. Calgary-West – Frank Penkala has been nominated as the Alberta Party candidate. Penkala previously sought the party’s nomination in the neighbouring Calgary-Bow district but was defeated by Paul Goddard in the nomination contest. Drayton Valley-Devon – Ronald Brochu was nominated as the Liberal Party candidate on January 18, 2019. Brochu was the Liberal Party candidate in Edmonton-Gold Bar in the 2015 election, earning 3.1 percent of the vote. Edmonton-Ellerlsie – Faton Bislimi is seeking the United Conservative Party nomination in this southeast Edmonton district. Bislimi is an Albanian activist and author from present-day Kosovo. According to his entry on Wikipedia, in 2007 he ran for mayor of Gnjilane, a city of 54,239 in southeast Kosovo. He is currently completing his PhD in Political Science at the University of Alberta. He received a master’s degree in public administration and international development from Harvard University’s Kennedy School of Government in 2007 and he worked as a lecturer of public policy and governance at the American University in Kosovo. Chuck McKenna has withdrawn from the Alberta Party nomination in this southeast Edmonton district. Richard Corbin and former Liberal Party candidate Todd Ross will contest the nomination set for January 26, 2019. A candidate selection meeting has been scheduled for January 26, 2019. Edmonton-Meadows – Chand Gul and MLA Denise Woollard are seeking the NDP nomination in this redrawn and renamed district in southeast Edmonton. Woollard was first elected in 2015 in the Edmonton-Mill Creek district. Gul is the president of the Alberta Pashtoon Association and previously worked for the Edmonton Mennonite Centre for Newcomers through the organization’s Community Connector Immigrant Women’s Integration network. She is the former chair of the women’s wing of the Pakistan-Canada Association of Edmonton. She was previously the South Edmonton Regional director for the Alberta Liberal Party and a member of the federal Liberal Party’s board of directors in Edmonton-Mill Woods, but she appears to have recently joined the NDP and attended the party’s convention in October 2018. Fort Saskatchewan-Vegreville – Jessica Littlewood was nominated as the NDP candidate in this district on January 20, 2019. Littlewood was first elected in 2015, earning 45 percent of the vote and unseating one-term Progressive Conservative MLA Jacquie Fenske. 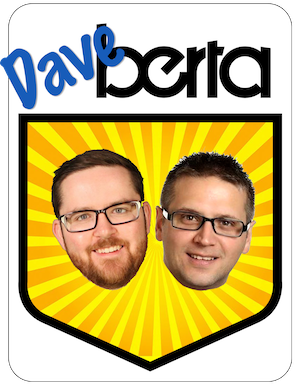 She has served as Parliamentary Secretary to the Minister of Economic Development and Trade since October 2017 and was recently voted Up and Coming MLA to Watch in 2019 in the Daveberta Best of Alberta Politics 2018 Survey. Leduc-Beaumont – Robb Connelly was acclaimed as the Alberta Party candidate in this district following the withdrawal of Jan Becker and the party not accepting the candidacies of Tauras Pawluk and Coreina Hubert. Connelly previously sought the Alberta Party nomination in the neighbouring Strathcona-Sherwood Park district. Gil Poitras is the first candidate nominated by the Alberta Advantage Party in this election cycle. Poitras served as interim leader of new right-wing party in 2017, and previously served as Chief Financial Officer for the Alberta Party in 2013 and 2014, and as the president of the Alberta Party association in Leduc-Beaumont in 2015. He served on Beaumont town council from 2001 to 2004 and ran for mayor in in 2013 and 2017. Lethbridge-West – Patricia Chizek was nominated as the Liberal Party candidate on January 7, 2019. Morinville-St. Albert – Neil Korotash defeated Wayne Rufiange to secure the Alberta Party nomination on January 19, 2019. Korotash teaches Biology and Urban Agriculture at Morinville Community High School and he sought the PC Party nomination in Spruce Grove-St. Albert ahead of the 2015 election. In 2001, Korotash became the youngest city councillor in St. Albert history when he was elected at age 21 in that year’s municipal elections. Olds-Didsbury-Three Hills – Chase Brown has been nominated as the Alberta Party candidate in this central Alberta district. Brown studied business economics at the University of Alberta and has coached special Olympians in softball, curling, and floor hockey programs. West Yellowhead – Zack Seizmagraff is seeking the Liberal Party nomination, which is scheduled to take place on January 25, 2019. Seizmagraff was the federal Liberal Party candidate in Yellowhead in the 2011 election, earning 2.87 percent of the vote. A candidate selection meeting has been scheduled for January 26, 2019. The NDP have scheduled nomination meetings to be held in Calgary-West on February 6, 2019, Calgary-East on February 16, 2019, and in Fort McMurray-Lac La Biche and Fort McMurray-Wood Buffalo on February 17, 2019. The UCP have scheduled a nomination meeting in Lethbridge-East for February 9, 2019. This entry was posted in Alberta Politics and tagged Alberta Advantage Party, Alberta Election 2019, Alberta Election Candidate Nominations, Alberta Liberal Party, Alberta NDP, Alberta Party, Amanda Chapman, Anam Kazim, Bonnyville-Cold Lake-St. Paul, Calgary-Acadia, Calgary-Beddington, Calgary-Bow, Calgary-Cross, Calgary-East, Calgary-Foothills, Calgary-Glenmore, Calgary-Hays, Calgary-North, Calgary-North West, Calgary-Peigan, Calgary-Shaw, Calgary-West, Candidate nominations, Chand Gul, Chase Brown, Chuck McKenna, Coreina Hubert, Dave Taylor, Denise Woollard, Drayton Valley-Devon, Edmonton-Ellerslie, Edmonton-Gold Bar, Edmonton-Meadows, Edmonton-Mill Creek, Edmonton-Mill Woods, Estefania Cortes-Vargas, Faton Bislimi, Fort McMurray-Lac La Biche, Fort McMurray-Wood Buffalo, Fort Sasktachewan-Vegreville, Frank Penkala, Gary Arora, Gil Poitras, Heather Erlen, Jan Becker, Jessica Littlewood, Joe Pimlott, John Daly, Jordan Stein, Kari Whan, Leduc-Beaumont, Lethbridge-East, Lethbridge-West, Lorissa Good, Melanie Wen, Moira Vane, Morinville-St. Albert, Naser Al-Kukhun, Neil Korotash, Olds-Didsbury-Three Hills, Patricia Chizek, Paul Goddard, Rachel Notley, Ricardo Miranda, Richard Corbin, Robb Connelly, Ron Reinhold, Ronald Brochu, Salima Haq, Sameena Arif, Sandra Jansen, Spruce Grove-St. Albert, Strathcona-Sherwood Park, Tauras Pawluk, Todd Ross, Tory Tomblin, United Conservative Party, Wayne Rufiange, West Yellowhead, Zack Seizmagraff on January 21, 2019 by Dave Cournoyer.